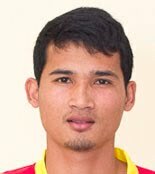 The Football Federation have slapped an 8-match ban on Phnom Penh Crown midfielder Phoung Narong(pictured) after his moment of madness interrupted the C-League match between his club and National Police last week. A national team player, Narong responded to a verbal altercation with Police defender Touch Pancharong by leaving the substitute's bench and racing onto the pitch, though he was quickly shooed off the field by his teammate Sun Sopanha. The match referee Thong Chankethya brandished a red card at Narong, as well as Pancharong, which inflamed the Police coaching staff, who ordered their team off the field and then refused to play on, forfeiting the match. The match was awarded to Crown 5-0, who were leading 2-0 at the time of the incident, 24 minutes into the game. Narong was suspended by his club the next day, indefinitely, as a result of his actions. The FFC ban of eight games will mean he will sit out the rest of the current season and the first four games of next season as well. It seems a mite harsh in my opinion, though I presume the FFC are sending out a message that they won't tolerate such behaviour. However, they have failed miserably to act strongly following other incidents this season, so it's pretty one-sided. The National Police for example, were fined a paltry $500 (2 million riels) for their failure to finish the match and warned as to their future conduct. I would've thought a much higher fine against the club, censure of the club officials who took their team off the field and a docking of points in addition to the match forfeit would've been more appropriate in the circumstances.